Brand:	March Performance Pulleys Product Line:	March Performance Chevy V-Belt Pulley Kits Pulley Style: V-belt Pulley Set Style: Performance ratio Pulley Material: Aluminum Pulley Finish: Clear powdercoated Crankshaft Pulley Included: Yes Crankshaft Pulley Grooves: 1-groove, V-belt Crankshaft Nose Cover Included: No Water Pump Pulley Included: Yes Water Pump Pulley Grooves: 1-groove, V-belt Water Pump Nose Cone Included: No Power Steering Pulley Included: No Power Steering Brackets Included: No Alternator Pulley Included: Yes Alternator Pulley Grooves: 1-groove, V-belt Alternator Fan Included: No Alternator Nose Cover Included: Yes Alternator Brackets Included: No Air Conditioning Pulley Included: No Air Conditioning Cover Included: No Air Conditioning Brackets Included: No Idler/Tensioner Included: No Idler Cover Included: No Idler Brackets Included: No Hardware Included: No Quantity: Sold as a set of 3. Notes: Fits long water pumps only. Pulley Set, V-Belt, Aluminum, Clear Powdercoated, Chevy, Small Block, Set of 3 * Check to make sure this part fits your application Quality pulleys that fit your Chevy. March Performance Chevy V-belt pulley kits are available for your big or small block Chevy applications with long or short water pumps. These kits come with either performance ratio or high water flow ratio pulleys, depending on your needs. 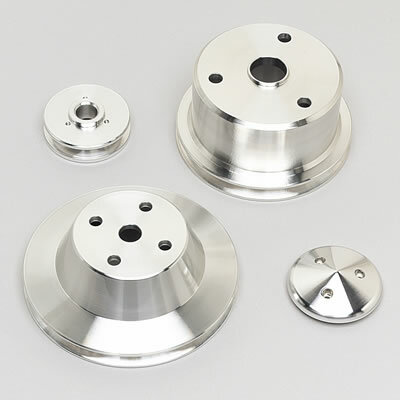 Both types of pulleys are precision CNC-machined from 6061-T6 aluminum and feature a clear powdercoated finish. Performance ratio pulleys reduce accessory drag and create about 12-15 HP in the rear wheels. Designed for daily street driving, these pulley kits also eliminate belt throwing. High water flow ratio pulleys increase water flow and fan speed, thus increasing cooling. This helps at critical low-speed driving, where most overheating occurs. Optional power steering keyway pulleys, power steering press-fit pulleys, and alternator fans are also available. This product was added to our catalog on Thursday 06 July, 2006.